I’ve decided to dedicate this week to furniture. There are actually several finished projects in my flat that I haven’t showed you! How terrible of me. 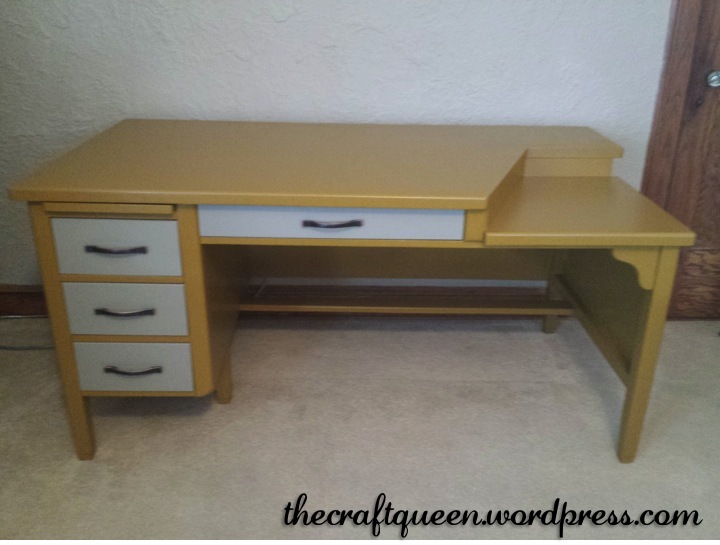 Today, I’ll show you the newest addition to our household, a beautiful vintage desk for my husband, Jason. 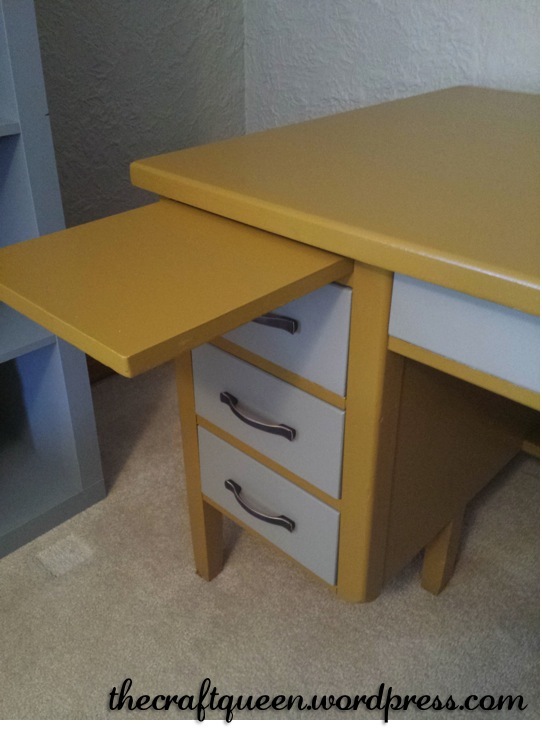 My husband recently started working from home, and he was in need of a new desk. A real desk. Something better than the cheapo Ikea tables we had sutured together like Frankenfurniture. I stopped by our local ReStore on Friday afternoon, and found this handsome fella. He was a bit tired and had some broken hardware, but overall in great condition and very sturdy. The price tag said $40, but lucky for me green tags were 20% off. The final cost was $33.79 including tax. I couldn’t bring this guy home that night (I had a performance with my dear friend Lex Allen), but I made a pit stop at Home Depot on the way home to pick out some paint. 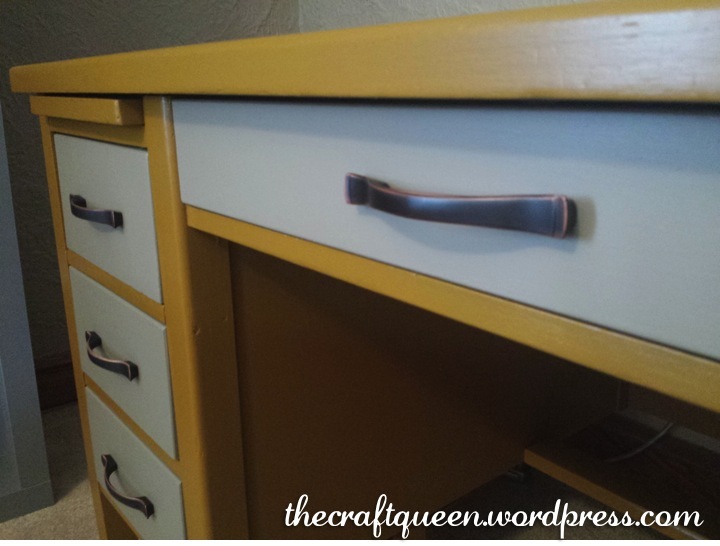 I decided on “Curry Powder” for the main body and “Ethiopia” for the drawer fronts, both colors by Behr. I bought a quart of the main color and a tester for the drawer fronts. The total for paint was $19.24. I wanted to buy new hardware while I was there, but I wasn’t able to measure the current hardware in order to purchase the correct size. Jason and I picked up the desk on Saturday morning, along with some hardware from Home Depot. 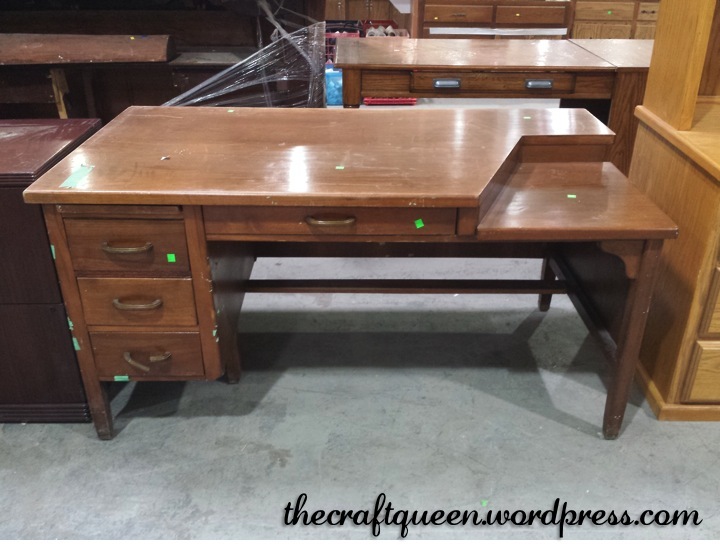 Four new drawer pulls came out to $21.04, bringing the grand total for the desk to $74.07. A steal, if you ask me. I got to work as soon as we got home. Jason helped me sand all the surfaces with medium grit sanding blocks. 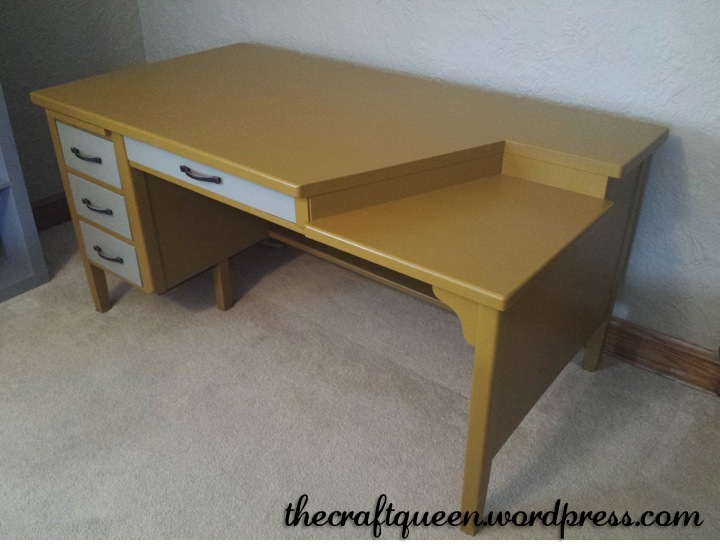 After wiping off all the dust, I gave the main body of the desk three coats of paint; the drawer fronts got two coats. I let the desk sit overnight to cure before adding the new hardware and moving it to its “permanent” position. I really love how it turned out, don’t you? Make sure to come back all this week to see my other furniture transformations! I’ll also be posting tutorials for our platform bed (finally!) and a cute ottoman I built from scratch. 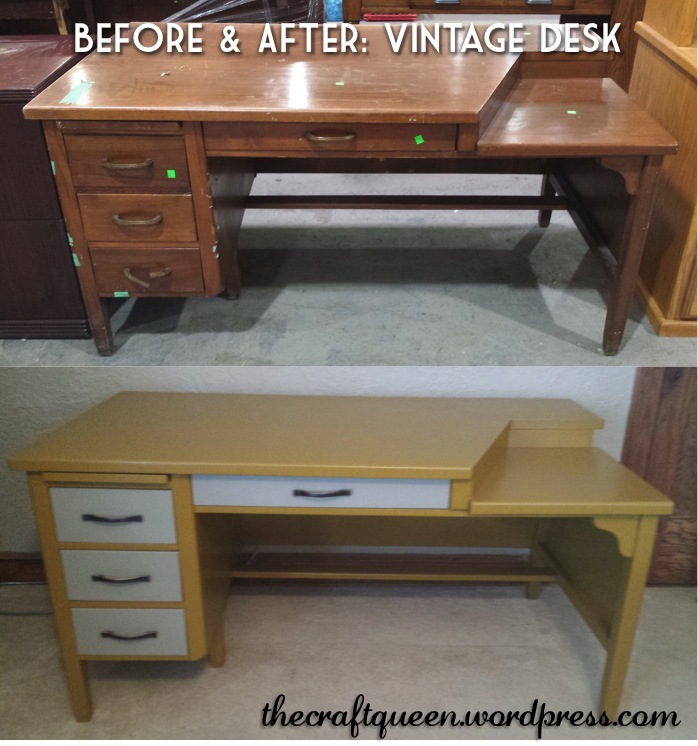 This entry was posted in Furniture & Home Decor and tagged behr curry powder, behr ethiopia, behr paint, diy project, furniture makeover, how to, instructions, painted furniture, recycled furniture, refreshed furniture, tutorial, upcycled furniture, updated furniture, vintage desk, vintage furniture. Bookmark the permalink.